Navaratri festival is very hot Gujarat.this festival is nine days long. 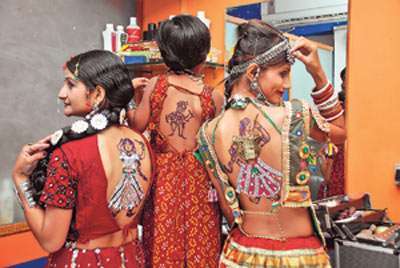 Navrati starts and all youth activities start to his body Tattoo. Young people create temporary tattoos on his body to the enormous variety of styles and designs. In Mumbai Gujarati person creates a tattoo in his body, and a premium is to start at Rs 25 and goes up to Rs 399, depending on the size and quality of work.